Anyone that has set foot on a Carnival Cruise Lines’ ship knows that the interior decor is rather flamboyant. The vessels are a montage of ideas and color that adds up to outlandish fun that is the company’s trademark. So, who is responsible for all this madness? 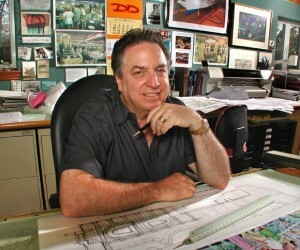 Joe Farcus, Carnival’s chief interior architect who has been an integral part in designing some of Carnival Cruise Lines most amazing ships. He has taken Carnival’s “Fun Ship” motto to the next level. Farcus’ latest designs onboard the new Carnival Splendor are deeply rooted in art, but also encompass his signature edgy atmosphere. For example the color palette and textures onboard Splendor are far from the norm with copper, pink and black stained woods, brushed aluminum, and glossy black tiles that surprisingly work. So, how did Farcus come up with all the interiors for the Carnival Splendor? Normally Farcus doesn’t know the name of a ship when he starts the design process, but he did know prior to starting that the name would be Carnival Splendor. “I took the name to heart when designing this ship. So I came up with splendid concepts for each area,” he says. For example, for the two main dining rooms — Gold Pearl and Black Pearl — he came up with the idea of “splendid jewelry.” For the El Morocco night club and bar he thought of “splendid night clubs” and drew inspiration from old photos of the famous New York City hot spot of the 1930’s and 40’s the El Morocco. For the casino he thought of a “splendid hand” and that was a Royal Flush — thus became the casino name. The interior promenade is punctuated with glass vitrines by Venetian artist Luciano Vistosi. And, for The Pinnacle supper club, Farcus redesigned the layout to add more seating and a dramatic feature: a glass dance floor suspended over the Lido buffet restaurant below. Not all of the ship is wild and crazy; there is one very traditional “splendid old liner” area — the aft pool deck. The retractable roof has been removed and the deck area now offers an unobstructed view of the ship’s wake just like liners of the past. The area is decorated in teak and the nautical theme is everywhere from the bar shaped like a bow of a ship, to the anchor chain barstools, to the half-models of the Queen Mary and Normandy that deck the walls. On and on it goes, each space was designed with a specific “splendid concept” in mind. How long does it take to design an entire ship? Farcus started designing the Carnival Splendor over two and a half years ago. He notes that it’s a long process from conceptualization to actual fruition. Farcus says Carnival has strong requirements for the number of berths and public spaces, and the shipyard will present its design for the hull. Also important is the ever changing regulations along with engineering and naval architectural parameters that Farcus must take into consideration. It’s not a simple undertaking. After he has completed his initial plans Farcus them works even more closely with Carnival, naval architects, and the shipyard. Eventually the design for the new ship is finalized and that can take anywhere from six to eighteen months. Filled Under Cruise Profiles, What's New? Ship design has become so high tech these days! Creativity is key. I like where Farcus is going. My little brother is going to school to be a ship designer, designing something that huge would be nuts tho..
Joe Fracus has set an example, he has taken ship designing to another level. Kudos for his innovative work. It’s cool that they have chosen a separate interior designer to come in and really give the ship some character. I like how everyone comes together to work on a single project, and the final result is something as awesome as the Carnival Splendor.